Sunday worship begins at 11:00 AM September to June, and lasts about an hour. Summer worship begins at 10:00 AM. For exact dates when fall or summer worship time begins, please refer to the calendar of events. Kids and babies? Kids are welcome at St. Andrew’s, with church school available September through June. Of course if you or they are more comfortable remaining in church they are most welcome – fidgeting not a problem. Children can also enjoy quiet activities provided in the sanctuary. Dress code? There just isn’t one, so you can feel comfortable in your usual sort of outfit, whether casual or more formal. Seating? When you arrive, a friendly usher will give you a bulletin and help you to the seat of your choosing. The sanctuary offers two levels, the large main floor seating area and the balcony. To reach the balcony, you can take the stairs on either side of the back of the main floor. The worship service? 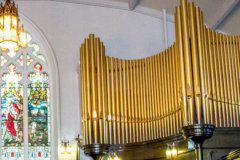 Although most Presbyterian worship services have common elements (singing, prayers, sermon) every church has a unique style and follows a different order of service. The weekly bulletin provides the information to help you follow and participate in the service. Be sure to pick up a bulletin from an usher when you arrive. Joining St. Andrews? After visiting you may feel that the time may be right to consider formalizing your relationship with St. Andrew’s. The membership process varies depending on baptism and prior membership in another church. The minister is pleased to offer preparatory classes in response to requests.